In early autumn 1979 a prison break began. Under cover of darkness the escapee slipped past his captors and away into the chilly English night. Disorientated but determined, the north American signal crayfish scrabbled across the foreign terrain in search of fresh water. The break-out was inevitable. Signals are fearsome among crayfish - stubborn and aggressive with large, versatile claws and a formidable climbing ability. The wire mesh covering the pond was bound to be conquered sooner or later. During the 1980s, thousands of signals escaped trout farms in the south of England. 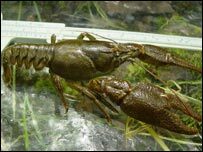 At that time, white-clawed crayfish - the only species of freshwater crayfish native to the British Isles - thrived in the UK's waterways. Three decades later, they would be decimated. Stephanie Peay, an ecologist and freshwater crayfish specialist, has spent much of her career studying white claws. "Most people don't know native crayfish were so abundant, mainly because they're nocturnal, but in the 70s they were absolutely everywhere," she said. "Back then, if you waded into any gently-flowing stream or river in the country and turned over a few rocks, chances are you'd find a white claw. "They're not cute or cuddly, but they certainly are very interesting animals, and people are usually very surprised at how large they are. They love clean, limestone streams and could often be found under all the biggest and best stones." In Cumbria, this is still the case - the county is a national stronghold for what remains of a once-numerous species, whose current dilemma can be traced directly back to the "great escapes" of the 1970s and 80s. White claws are no match for the invaders. Beefy and aggressive, and twice the size of the native species, signals have the physical advantage when competing for food and habitats. But their most devastating weapon has nothing to do with size. As the current flows around a signal, it often disturbs a colony of tiny spores clinging to its shell. These are easily dislodged and quickly swept away. Some embed themselves in rushes or reeds, others travel uninterrupted for miles. It is a common scenario. Since the signal arrived in the UK, hundreds of rivers have become infested with the fungus known to science as aphanomyces astaci, or more commonly, crayfish plague. 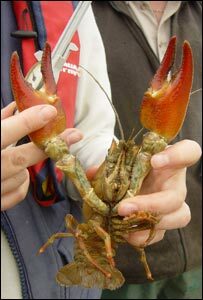 Despite its name, crayfish plague is harmless to the signal crayfish. Just as a mosquito is unaffected by the deadly malaria in its bloodstream, so the American species is immune from aphanomyces. Not so the white claw. Within days of the spores entering a river, there is little that can be done, according to Chris Rostron, a water wildlife conservationist. "White claws don't have a chance. Their immune system will not recognise the fungus, and it will spread unchallenged through their body. "If you find one that's died from the plague, it's pretty unpleasant. It might look fairly normal from the outside, but if you break open the body there'll be nothing inside except fungus. "It literally eats them alive, like something out of Alien. "After this, of course, the fungus is able to release millions more spores into the water." Signal crayfish are much more predatory than white claws. They produce greater numbers of eggs, grow more quickly and become much larger. Needless to say, there are considerably fewer white-clawed crayfish living today in streams and rivers in the south of England. Cumbria, so far, is apparently untouched by the signal crayfish, and has been designated as a site of importance for Europe's dwindling white-claw population. However, this situation is likely to be short-lived. The threat is so imminent that various 'Ark' sites are being sought out - remote bodies of water, such as large ponds and lakes, too distant from contaminated rivers and streams for the signal crayfish to reach. Here, it is hoped, they can at least be maintained. It is appropriate that the species may avoid extinction simply by hiding away in this manner, surrounded on all sides by danger, but just out of reach. This is, of course, how the individual white claw survives - concealed under a rock or burrowed into a river bank, a whisker's breadth away from prying claws and hungry mouths. But perhaps it is simply the lesser of two evils. Better to exist in small numbers, just out of harm's way, than not to exist at all.